The Funky Felter: What's your dye method? The process of hand dyeing wool, silk, and other natural fibers with professional acid dyes or whatever you prefer! What's your dye method? The process of hand dyeing wool, silk, and other natural fibers with professional acid dyes or whatever you prefer! I must admit that the majority of fibers that I've used for felting thus far has been professionally pre-dyed. I just recently started having an interest in taking the next step to dye most of my own fibers. In the past, I have dyed quite a lot of silk as well as some wool roving. In doing so, I ordinarily use the kettle dyeing method with Cushing's Perfection Dyes, professional acid dyes for wool where you just add white vinegar to the mix. This process of just mixing everything in a large simmering pot has worked very well so far. Recently I have been thinking about switching to Jacquard Acid Dyes as it seems to be a favorite among spinners and other fiber artists. From what I understand, it is also a professional acid dye where you just add vinegar to the mix. I like the ease of this dyeing method and have found it to be difficult to really mess things up in this process. (Although, you do have to be careful with your wool roving because it will felt with too much agitation.) I have used other dyes previously on silk such as Pro MX Reactive Dyes, but there are more steps involved as well as the use of salt and soda ash. The results were good, but I found myself always having to refer to the directions to complete the process which slows down everything. Since I have several jars of this kind of dye left, I may try to use it up eventually. I think that I have spoiled myself though with the "just add vinegar" method of professional acid dyes. This brings me to my questions for you......... What's your dye method? What type of dye do your prefer? And, do you like to kettle dye or hand paint your roving, or perhaps you have a different method all-together? I also wanted to share with you this wonderful blog post by Inger (ingermaaike on Etsy). It is a tutorial on how to dye very fine wool. One of my fears with dyeing wool roving is that it will felt in the process because you are applying heat to the fiber. I have had that happen only once that I remember, and it was very frustrating and disappointing. Inger's wonderful blog post details how to dye your delicate wool without having those awful issues of it felting in the process. And, her blog is full of informational posts about feltmaking, spinning, and more. 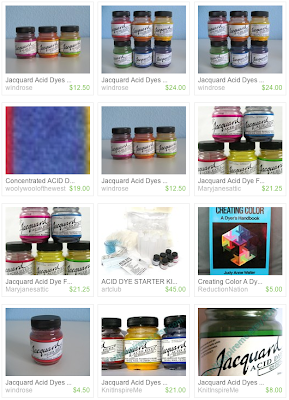 Also, the image is a screen shot of some of the acid dyes available on Etsy. As you can see, windrose and Maryjanesattic both offer a nice variety of Jacquard Acid Dyes. You can also find professional acid dyes on sites like The Dharma Trading Company and The Bellwether. Don't forget to leave a comment and let me know what dye method you prefer! I learn so much when my readers share their techniques, resources, and personal experiences. I thoroughly enjoy your comments and appreciate them too! Thank you in advance! I've been having fun using a professional dye from Pro Chemical,kettle dyeing and rainbow microwave. I did buy their citric acid to use with it instead of vinegar (less odor to wash out after). Also worked with some natural dyes at our spinning guild last year, indigo is smelly since it needs lye mixed in the dye bath but it is fascinating to see the color change happen as the oxygen in the air is the cause of the color blooming? My dyes of choice are typically Cushings and Jacquard, as the acid dyes are so easy to mix up and use. I've been using Jacquard Acid dyes on a regular basis. The powdered dyes come in quite a variety. I, usually buy from Dharma and dye my own. I've done the steaming over the stove, wrapped in plastic, hot water pour and cold water pour. I, prefer the hot pour method. I've used Procion Fiber Reactive Dyes,too but prefer Jacquard acid dyes. Anyone had experience with the Colorhues dyes? I have to say, I've been following your blog for only a short while and your posts are always extremely helpful and diverse in topic. I can tell that you enjoy what you do and we all appreciate the sharing of information. Thanks!